Bahati’s was once dating Yvette Obura . The two were young and in love and, in the process ended up doing a lot of stupid things..like getting tattooed. But it’s not what you think. 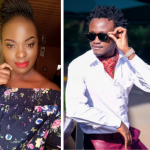 Recently, the mother of one had to explain why she still has Bahati’s name tattooed on his bosom despite parting ways and each getting another partner. Daughter On social media, Obura came out to explain why she has the tattoo saying that the name is actually her daughter’s, not Bahati’s. Yvette is Bahati’s baby mama, they have a daughter together, Mueni Bahati. “My tattoo had to be something so meaningful and something I love and it happened to be MUENI BAHATI. Thoughts? ?” she asked. Obura recently confessed that she has already gotten another man and she’ll soon have a wedding. The post ‘Who will marry you with that?’ Bahati’s ex forced to explain why she has his name tattooed appeared first on Ghafla! Kenya.